Read-out Instrumentation Signpost: AC/DC Power supply. The new BET-0900-T, a highly efficient and very robust external AC/DC power supply unit for industrial use with an output of 90 W has been introduced by Bicker Elektronik . It meets the stringent requirements of the US Department of Energy (DoE) for energy efficiency level VI, as well as the current European energy efficiency standard EU-CoC-Tier2. This applies in particular to the power consumption in standby mode, which is less than 0.15 watts and the typical efficiency of 90%. The external AC/DC power supply with wide-range input of 90 to 264 VAC and active PFC also impresses with its high reliability (MTBF >869,000 hours), which is ensured by the exclusive configuration with +105°C premium electrolytic capacitors and a robust circuit design. Thus, the BET-0900-T is ideally suited for 24/7 continuous operation in the wide operating temperature range of -20°C to + 60°C. Three models are available with accurately regulated DC output voltages of +12V, +19V or +24V. For additional reliability, the BET-0900-T has short circuit and overload protection with auto-restart, as well as over-voltage and over-temperature protection. 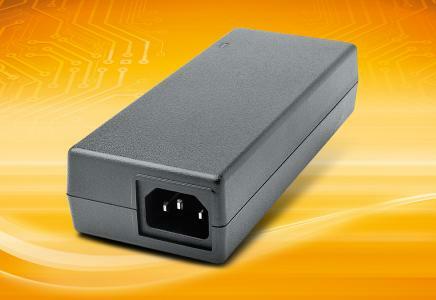 The isolation voltage between input/output is 4242 VDC. The protective conductor PE (primary) is connected to -Vout (secondary). No base load is required at the output so that the latest generation Intel® Core™mainboards with special power saving modes can be supplied safely. In addition to the current energy efficiency standards, the BET-0900-T has the EN/UL60950-1 safety approvals. The standard built-in DC hollow connector on the power supply output can be customized for specfic applications by special connectors, such as locking dc plugs. Optional accessories are available from Bicker Elektronik: The Cling Pad KP-01 for quick and easy mounting of the external AC/DC power supply on smooth surfaces, a practical adapter PSZ-1008 (DC jack to screw terminals), the three-pin power cable Y1-132 with IEC-60320-C13 and the DC extension cable CB-TRG-EXT. In addition to the long-term availability of at least 5 years Bicker Elektronik grants a warranty of 3 years on the external AC/DC power supply BET-0900T.